Some of the resources mentioned in the presentation can be accessed at the following links. Please don't hesitate to contact me with any questions or concerns. Let's continue to connect and share our math learning with one another! I looked through the presentation you were so kind to share and feel inspired. By the openness you show in sharing your learning and thinking, and the rich ideas you offer every time. 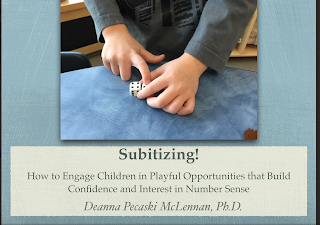 Subitising is such an important skill and necessary for understanding of number. Thanks for sharing your resources.